Today’s Friday photo is of one of the of glacial erratic boulders in Cotteridge park. Cotteridge park was one of the many parks created in the early 20th century for the health and wellbeing of the inhabitants of Birmingham. There are a great number of these glacial boulders in the area, one mentioned in a previous Friday photo is located next to The Great Stone Inn, Northfield. It is very interesting to think these boulders travelled all the way from North Wales during the ice age. 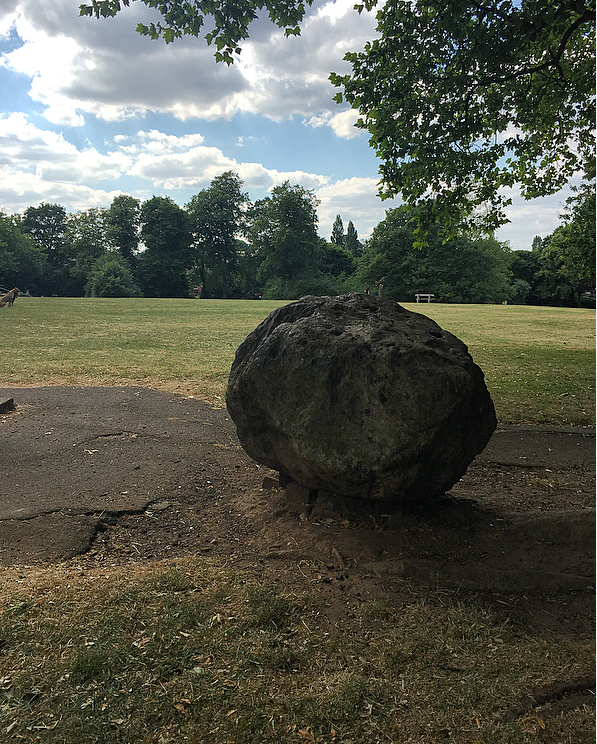 Recently, there has been heritage lottery funded activities in the park concerning the boulders, with a view to inform residents of their history and make them safer for the future. Friends of Cotteridge Park is in the middle of a project funded by the Heritage Lottery Fund to learn more about the erratics; their geological and more recent history. Thanks to the work of Professor Ian Fairchild, Dr Ella Young, colleagues and volunteers we now much more than we did before. Get in touch if you’d like to find out more or can you tell us more? Do you have any photos of you or your family sitting on the rocks in your youth? If you’ve got your request in a Twitter friendly format or jepg then feel free to email it over to vicki@birminghamconservationtrust.org and we will be happy to share it on our Twitter feed for you.